Starting with Advance Design 2011 the drift verification can be done automatically taking into account specifications from current standards. NOTE: Drift verification will be done only for seismic load cases or combinations with seismic loads. 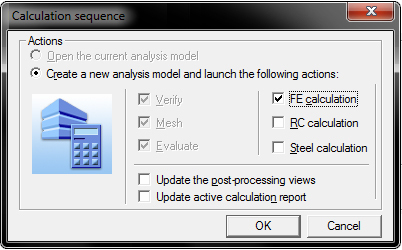 The first steps in a successful drift analysis begin with the correct definition of the model - all of the structure's levels must be assigned. Next define the seismic load cases. It does not matter what type of spectrum is used (Elastic or Calculation); Advance Design will make the corrections taking into account the reduction factors and the behavior coefficient. All that remains is to analyze the model and then extract the level drift verification tables. To view the tables: Menu bar - Documents - Generate a new report. 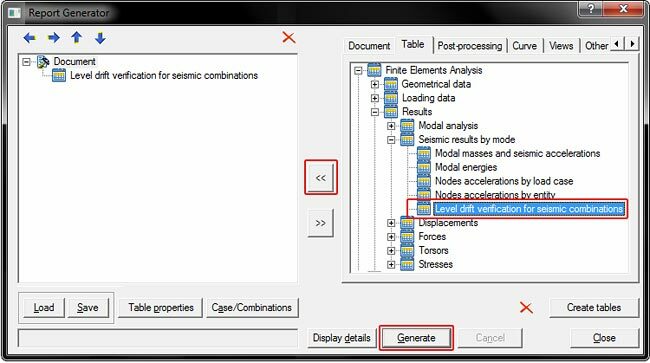 In the report generator window, on the Table tab follow the Finite elements analysis tree: Results - Seismic results by mode - Level drift verification for seismic combinations. The available results are from an envelope between all combinations; the values for relative displacements are maximum values.